I feel like the first round of colds/flu has begun so soup and stock making will be on my regular rotation for meals now. Getting a great soup and then adding protein is such a fantastic way to get all the macronutrients in one fell swoop. Cauliflower and Celery Root are going gangbusters right now and it's never a bad idea to add kale to anything you are cooking up right now. We added some shredded roast chicken to this soup this time, but literally any type of protein is a welcome addition to this soup or just have it on it's own as a starter to any meal. Preheat oven to 400. Toss cauliflower and celery root with 1-2 tablespoons of olive oil (or more) to evenly coat all vegetables. Spread out on a baking sheet in a single layer and sprinkle with sea salt. Roast for 10 minutes then turn over the vegetables with a spatula and roast for an additional 10 minutes or until tender. In the meantime bring the chicken stock to a simmer and add the sweet potato in the chicken stock until tender, about 20-30 min. Wash and strip the kale leaves of their tough stems then cut into strips and small pieces. When all the vegetables have been cooked, in batches, combine them with the stock in a blender or food processor and puree--adding to pot on the stove until finished. If soup is too thick add water until you get to your desired consistency. 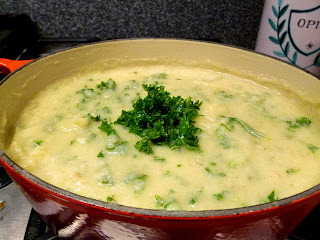 Add the kale to the puree in the pot and simmer for an additional 10-15 minutes. Salt and pepper to taste. I'm hoping with this blog I can inspire you to start looking at your food more closely. Where does it come from? Can I have a conversation with the person who is selling it? Do they know where the food came from? How can we stay vibrant and productive in our lives? I hope you start thinking about cooking your own food more and that you own your health and well-being. The world of food is changing rapidly around us and we live in a time (and a place) that allows us to ask these questions and to demand that our food makes us strong. I have endeavored for the last 5 years to feed ourselves mostly with food that grows or is farmed within a +/-100 mile radius of where we live. We are lucky enough to be in an area where this is possible--although for those of you not living in Nirvana, it's very much worth your while to seek out and reward those businesses or farms who are striving to bring you real, thoughtfully raised or grown foods. I strive to only buy organic, pasture raised meats and eggs. We threw out almost all of our processed foods-although go to them from time to time in a crunch as long as they are organic and have a minimal amount of ingredients. When we go out to eat we try to stay away from too many kids menu items and let the kids share an adult entree or at least order an extra side of steamed veggies to fill that chicken strip gap. The occasional In-N-Out run exists for us, but we really strive to make those occasions rare. More and more, as the children have gotten older and are able to help with meal prep we've moved away from eating out--the food just isn't as good and it's always kind of a let down to pay an exorbitant amount of money for a salad that we could just as easily made at home with minimal effort. We're not perfect, but our main goal is to get the most nutrition out of food as possible. None of us has had to go to the doctor for any illness. Seriously. No flu (and we didn't get flu shots), no strep, no virus--trust me, we get notices constantly from their school that illness is abundant. The occasional runny nose, sure, but they have missed no more than a day of school in each school year due to illness for going on 5 years now. They get a little sick, we address it with homeopathy and they get over it. This blog will give glimpses into how we go about doing that through a sound diet. The End of Overeating, David A. Kessler, M.D.